I finally have time to post more projects from my Boo‘s Artsy Birthday Party. 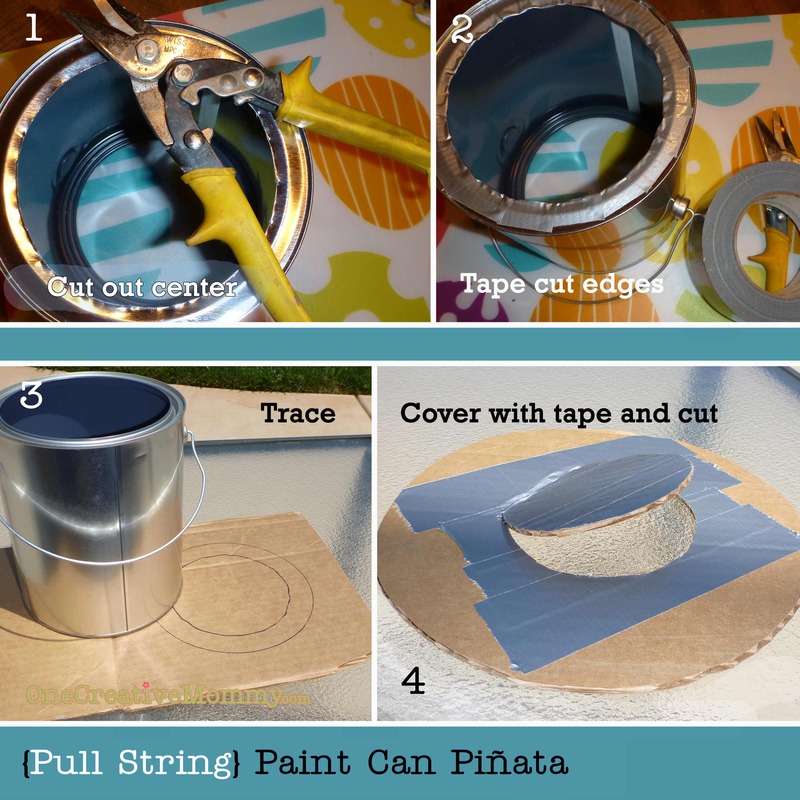 Here’s a tutorial for her Paint Can Piñata. 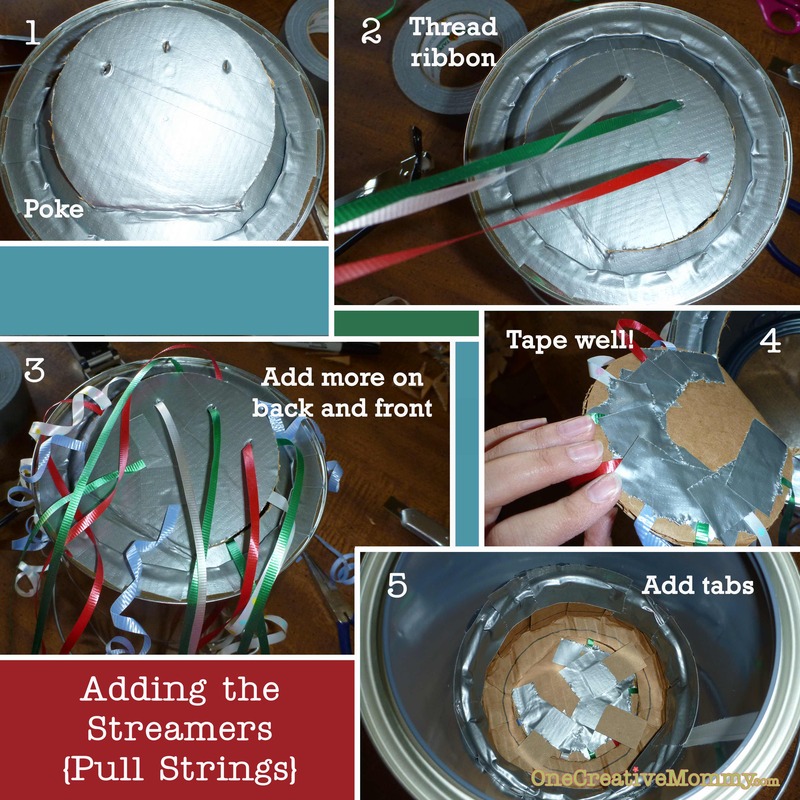 As long as you can get your hands on some tin snips, this is an easy and inexpensive project. 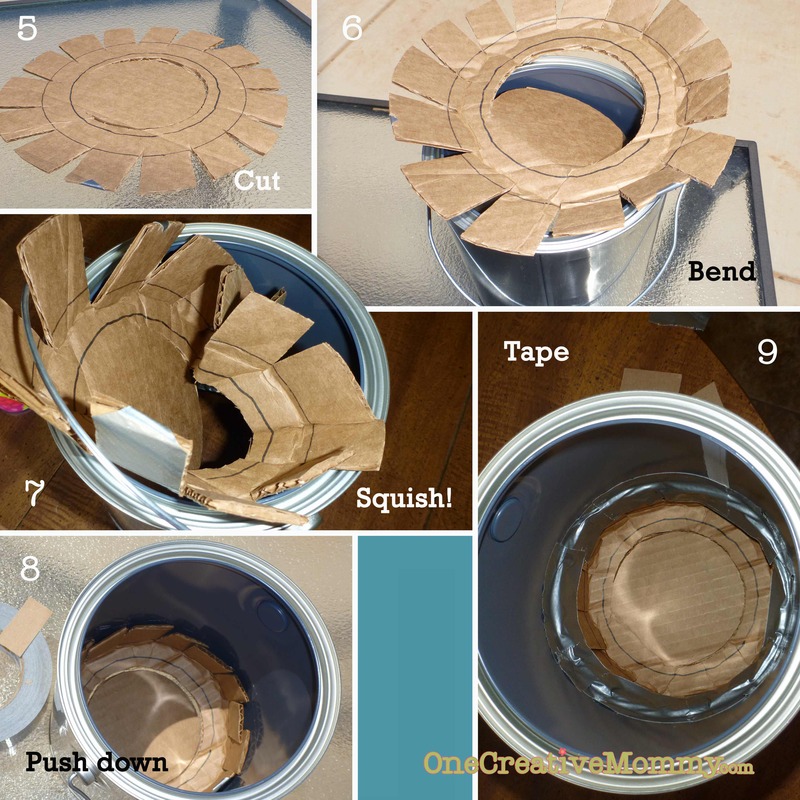 Place the can on top of your cardboard and trace around the outside of the can and around the inside of the hole you just cut. Cover the back with duct tape, and flip it back over so that you can see your traced lines. Move about 1/2 toward the center from your inside circle, and cut out a round hole–leaving 1/3 of the circle uncut. (This will fold back to make your trap door where the candy will come out.) You can cut along your center circle instead, but it might be a tight squeeze for the flap to open up. Trim the cardboard into a large circle (leaving about 2 inches from the traced outside edge of the paint can). Cut notches into the circle, slightly overlapping the outside circle. 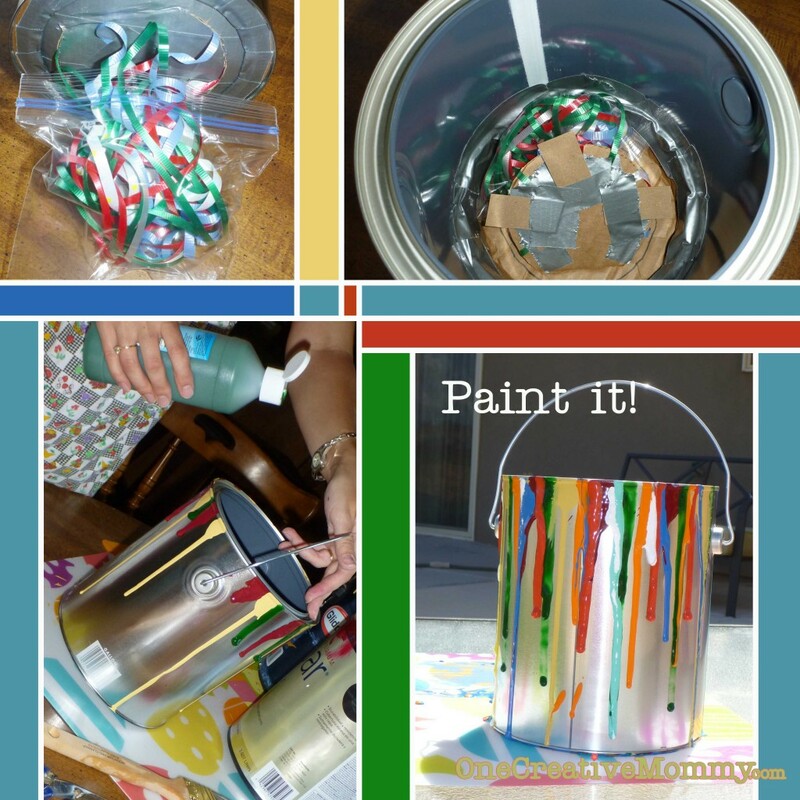 Place your “sun shape” on top of the paint can and fold and squish it until you can get it inside the can. (Don’t worry–it can squish a lot without being damaged.) Push the squished sun down into the can and center the cut flap over the hole in the bottom of the can. Test your flap to make sure it opens! Now, use one hand to push the cardboard down as far as you can, while you use the other hand to tape around the inside–holding the cardboard in place. Now you will attach the pull strings. You only need two or three strings firmly attached that will actually pull open the trap. I chose to attach three. Poke three holes into the front of the trap–away from the part that folds. Thread one ribbon through each hole and knot on the inside of the can. Tape over the knots. Attach the rest of your ribbons however you would like (one per child). I taped some to the outside center of the flap and others on the outside edges (I taped those inside the can). Make sure the ribbons are not loose! Tape well. Put the can in the sun to dry, and you are done! Fill it up and get ready to party! I’d love for you to share your creative ideas on One Creative Weekend! The linky party is live every week from Friday to Wednesday. Come and join the fun! Brilliant idea and so much fun!! That looks awesome! 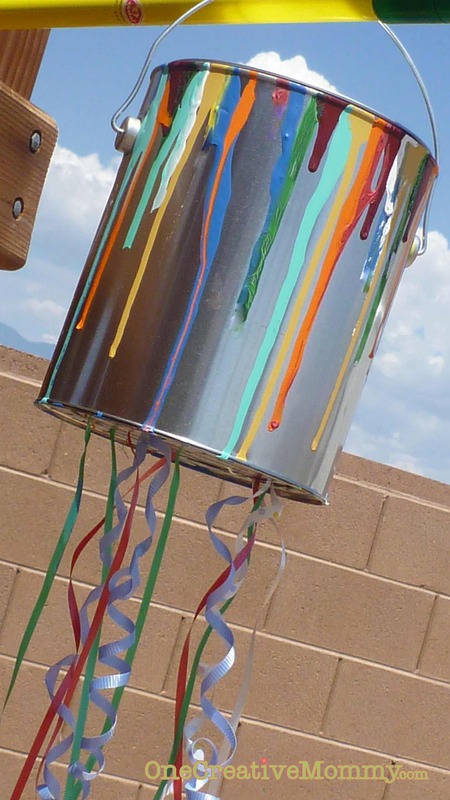 It looks like it would be a lot of fun and I really like the streaks of paint down the sides! What a fun idea! I love this. So much safer! 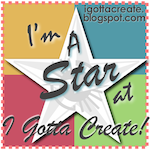 By the way, I think I fixed my pinterest button issue (yay!)! Thanks for linking up! This is too cute! I love the little drips down the side, and that’s a brilliant idea about putting the candy in individual baggies so it’s “fair”! Thanks for sharing at The Fun In Functional! That is such a cute idea! I have never seen that before. Looks like fun… I like the paint dripping down the sides. What a wonderfully cute idea! I also favor your way of making sure every child feels part of the “pinata experience” and gets an equal amount of treats. In the past I have used your idea of individual treat bags. There were different age groups present so we put name tags on them and that worked too – the youngest kids didn’t get anything that was a choking hazard. what a fun party idea! It looks fantastic! This is so awesome! I love it; although I bet the kids loved it even more! :) Thanks for sharing last week on Saturday Show & Tell at Cheerios and Lattes. You are a featured favorite this week! Can’t wait to see what you share this week! Pull string pinatas are so great for little kids! I am always a nervous wreck when blindfolded kids of any age are swinging a stick around, but with little kids.. Yikes! And I never ever considered making one of my own! Great tutorial! Thanks! I’m on my way to visit your site. That’s so clever and fun! 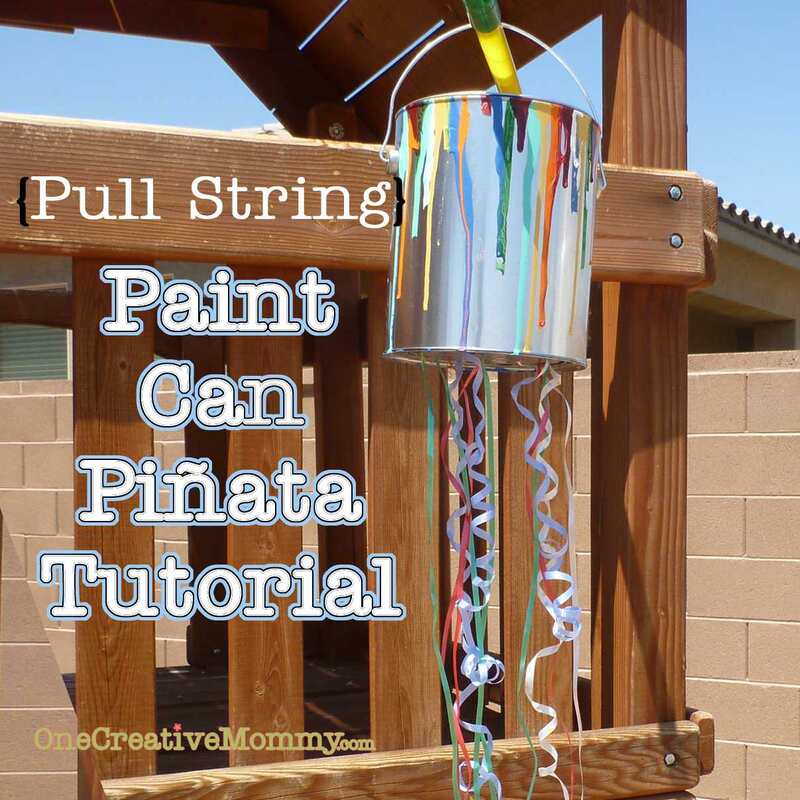 I had a pull string pinata when I was a kid! Very cool DIY idea. Thanks so much! I gave your site a shout out! 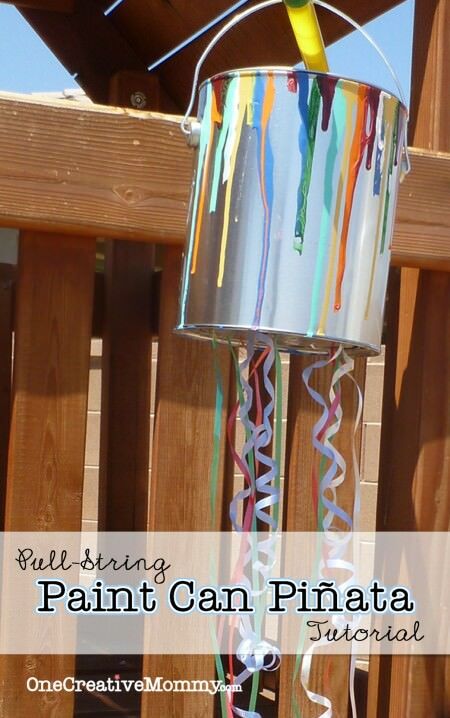 I’m so excited to do this at my 5yr olds party! Last time we did a piñata she ended up bawling due to everyone beating the poor animal to get candy (she was 2 and thought the cow was her friend). We are doing a paint party, so this is perfect, no one (or animal, lol) will get hurt! I didn’t know if each child pulled a string at a time, or do they all pull together at the same time? It looks as if one pulled, it would open, please help clarify this for me, thanks! Great idea! I am featuring this on an Art Party Roundup on my site with a link if you don’t mind. That would be just fine, Alyssa. Thanks! I’m glad you like it. Thanks for taking the time to comment.